The December 21 Catalan election saw a narrow pro-independence majority and a region more divided than ever. The Catalan elections on December 21 were meant to mark the end of Spain’s constitutional crisis. After an unofficial referendum; the arrest of prominent pro-independence figures; and the suspension of Catalonia’s government, Spanish prime minister Mariano Rajoy called the elections in the hope of securing a unionist majority. Yet the results saw pro-independence parties maintain a narrow majority, winning 47.5 percent of votes and 51 percent of seats. 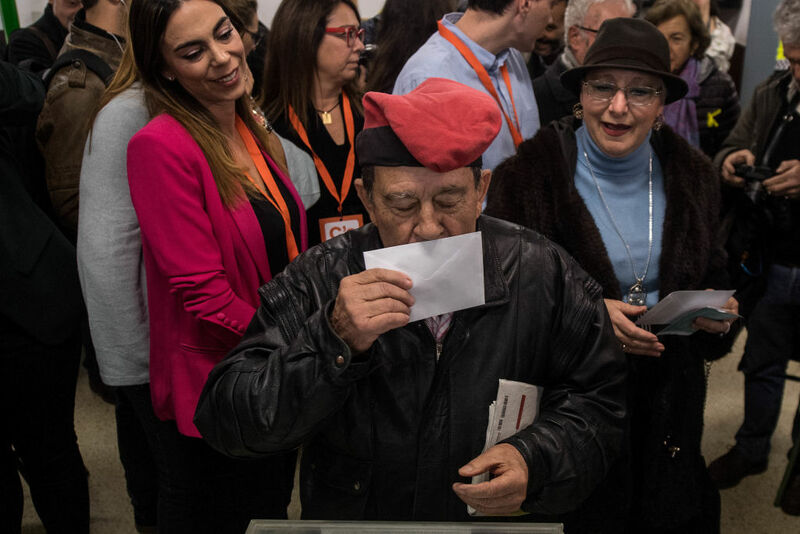 The election also saw the general weakening of left-wing forces and the rise of Ciudadanos, a neoliberal and Spanish-unionist force, as the biggest single party. The 79 percent turnout in last Thursday’s vote indicated how important the election was for Catalonia’s future. Yet the result seems to offer fresh deadlock between the two rival camps, and an enduring battle over the constitutional question. Why did Rajoy’s gambit fail? Why did the recent turmoil have so little effect on the overall support for independence? What explains the dramatic shifts of support within each camp? What kind of voters sided with Ciudadanos? And what significance does the Catalan crisis have for the Spanish left as a whole? David Broder spoke to Steven Forti, co-editor of the recent book El proceso separatista en Cataluña, about the meaning of the election and the way forward for the region. 2017 Catalonia parliament election results. Let’s start by talking about the overall results. The pro-independence parties have once again secured a slight majority in the Catalan parliament, if not a majority of the votes. This result came despite the fact that Premier Mariano Rajoy called these early elections with the specific intention of removing Carles Puigdemont and his allies’ majority. Can we now assume that there will indeed be a pro-independence government in Catalunya? There are a lot of unknowns. Given the result I do not think there is any possibility of any other kind of government being formed in the Catalan parliament. If we take the pro-independence parties as a whole, including JuntsxCat [Puigdemont’s center-right party; 34 seats], Esquerra [the center-left party, 32 seats] and CUP [an anticapitalist party, 4 seats], then they maintained their majority of seats. They lost just two seats, and added over 100,000 votes compared to 2015. They lost a fraction of 1 percent as compared to last time as turnout was higher, but remained around 47.5 percent of the vote. So they have a majority of seats, but not a majority of society behind them; rather, what we have is a stalled situation. As for the possibilities for the future, certainly they will try and form a government on this basis. One of the unknowns is whether JuntsxCat and Esquerra will involve the CUP in the government majority as they did in the last two years. The CUP is unilateralist and calls for the immediate building of the Catalan Republic, which this party insists was declared already in October. Meanwhile Puigdemont and the Esquerra leader Oriol Junqueras take a more “possibilist” approach to the prospect of taking a unilateral road [i.e., they understand that they may not be able to achieve independence without Spain’s consent]. At points Esquerra said that they will abandon the unilateral route to independence, at other times, the opposite. Moreover, since JuntsxCat and Esquerra have 66 seats, and need 68 for a majority [of 135 seats], they would just need the CUP to abstain in order to elect a pro-independence president and maintain their government. The anti-independence parties, Ciudadanos, the Partido Popular [Rajoy’s center-right party] and the Socialists, only have 65 seats, even if we include Catalunya en Comú in their total. So that’s one possible scenario. But there are other unknowns. One thing is that Puigdemont is in Belgium. If he returns to Spain, he will be arrested. The question is whether he will be able to attend the investiture of the parliament and present himself as a candidate for president. He cannot do this from a distance, so the question is whether a judge will give him dispensation to attend. So it would be impossible to form a government, because of the jailed MPs? There are four MPs newly elected to the parliament, who make up part of the pro-independence majority and who are abroad and face the same situation as Puigdemont. As well as these , who will be arrested if they return, are three pro-independence MPs, including the Esquerra leader Junqueras, who are in prison in Madrid. So that means that there are eight MPs in the pro-independence majority who will not be able to attend the investiture of the Catalan parliament. This would leave the independentists in the minority. This gives rise to several unknowns. One possibility is that the jailed will ask a judge to give them dispensation them to attend, allowing them to take part, or at least to vote in the investiture session. A further possibility is that the eight people who have been elected but cannot attend could resign, and then their seats would pass down their party lists, thus replacing them with other candidates for their own parties. This would maintain the pro-independence numbers in the parliament, but would also mean that the pro-independence leaders — notably, Puigdemont and Junqueras — would not be able to take part in the majority or the government. It is hard to see that happening in the current situation, as Puigdemont certainly wants to be reinstated. It would be very difficult for Ciudadanos to form a government, simply because of the numbers. It would only be possible if the eight arrested and jailed MPs were unable to attend. But that would be counterproductive from the point of view of the pro-independence camp, so the eight MPs concerned would surely have to resign and allow themselves to be replaced by fellow party members. But the whole situation is very fraught. One of the most important dynamics here is the struggle for hegemony within the pro-independence camp, between Puigdemont’s JuntsxCat list formerly known as Convergencia, and the Esquerra. It is true that Puigdemont defied the opinion polls, all of which said that Esquerra would beat his party, and in the election JuntsxCat were slightly ahead, 34 seats to 32. But this was a minimal difference: there was just 0.3 percent and 12,000 votes in it. On election night Esquerra said that Puigdemont had won and that they considered him the future president. But the struggle for hegemony has been going on for a long time and it is still continuing even now, especially in a situation where it is hard to see how Puidgemont could come back to Catalunya and resume office as president. So we will have to see what Esquerra does and if they push for concessions. Do these two parties have different positions on the unilateral road to independence? There were reports of Esquerra leader Oriol Junqueras adopting a softer line on this question. Yes, so it would seem. But Esquerra has been very ambiguous. After October 27 [when Spain imposed direct rule] and in the first week of November some independence leaders, particularly from Esquerra, adopted a rather self-critical note, saying that “we’ve tried to reach further than we can stretch, the unilateral road to independence was a mistake,” and so on. But during the campaign for the parliamentary elections on December 21 they went back on this. Doubtless Puigdemont took a more radical position, but then we also have to consider that taking firmer positions during the election campaign is itself part of the battle for hegemony within the pro-independence camp, given how mobilized pro-independence forces have been in recent years. The battle between Esquerra and Puigdemont’s party is also very important in terms of understanding how the crisis unfolded in September and October. After the October 1 referendum, there was a kind of game within the Catalan government where each force sought to outbid the others. Indeed, on October 26 Puigdemont was himself thinking of calling a Catalan election, but then changed plans and instead decided to declare independence, in turn prompting the Spanish government to apply Article 155 [suspending Catalan autonomy]. But here there was a logic where neither Esquerra nor Puidgemont wanted to be the one to say “we’ve come along this far but now need to press the brake pedal,” because then the other could have said that they had kept the flag flying while the others had demobilized. I fear that this game between them will keep on going, as they each try to advance their own party within the pro-independence camp, even though what they say does not correspond to the reality of their practical politics. As we have seen, at the level of practical politics they cannot do anything: when the Spanish government applied Article 155, the pro-independence parties were not supported by other countries, by Catalan business, or even an absolute majority of society. So in the next few weeks we will see if they maintain this unilateral course. In this sense is it not surprising that there was such a sharp fall in the vote for the [anticapitalist, pro-independence] CUP? It intransigently called for the unilateral creation of the Catalan Republic, and fell from 10 to 4 seats. I do not think it is very surprising. In 2012, when they stood for the first time, they got 126,000 votes. Now they have 193,000, with the large increase in turnout. In 2015 they did much better, with 337,000 votes, but there is one main factor that explains the difference. In the last elections Esquerra and the old Convergencia party stood in the elections as a coalition, under the banner of JuntsxSi. Some Esquerra supporters consider themselves of the Left, even if in reality it is a center-left-lite kind of party. So rather than vote for a bloc including Convergencia, a party of the center-right, in 2015 they preferred to go with the CUP. Now that Esquerra is going it alone, these voters have come back into the fold. Perhaps there are people who voted CUP in 2015 who disagree with the position they took on the unilateral road, but I think for the most part they went back to Esquerra. There is also a struggle for hegemony within the anti-independence, “unionist” camp. Obviously one prominent sign of this is the rise of Ciudadanos, whose 36 seats on December 21 made it the largest single party. Mariano Rajoy had taken a very hard line against the independentists, also for the sake of consolidating his support in the rest of Spain. Yet his Partido Popular (PP) performed very poorly in this election, collapsing to just 4 seats. How has Ciudadanos taken such a vast lead over the PP within Catalunya’s own unionist camp? Ciudadanos’s rise is a key question for the political future of Spain as a whole, and not just Catalunya. Remember, this is the first time that a party that was not catalanista [i.e., upholding catalanismo, the affirmation of Catalan identity and sovereignty, if not necessarily independence] came first in the Catalan elections. From that point of view this is an exceptional, truly historic result that could have a lot of consequences. Clearly, the PP lost a lot of votes because of how it has handled the Catalan crisis. There is a part of the Right that called for a tough line against the pro-independence parties long before the crisis of September-October. Even before summer, Ciudadanos were calling for the application of Article 155 [to suspend the Catalan government], in order to thwart the independence parties. A part of the right-wing PP vote in Catalunya has shifted to Ciudadanos because they have always taken a much sharper line. It is, much more clearly than any other, the party defined by its opposition to Catalan independence. It is worth remembering that the PP has in the past reached agreements with Catalan sovereigntists: for example, José Maria Aznar’s first government in Madrid, from 1996 to 2000, relied on the support of Convergencia, then led by Jordi Pujol. And at that time the PP also supported Convergencia in the Catalan parliament. That is in the past, but not so long ago. And even Artur Mas’s first Catalan government from 2010 to 2012 relied on a confidence and supply deal with the PP. Conversely, Ciudadanos is a force that has never been in government, and which is seen as not being corrupt like the PP. It has always shown itself to be absolutely opposed to Catalan nationalism. So it gains something from this. Moreover, Ciudadanos has succeeded in rallying votes within the constitutionalist [i.e., opposed to independence, which is prohibited by the Spanish constitution] camp because of the polarized situation. This also explains the higher turnout: many voters who did not normally vote decided to go for Ciudadanos, because they do not want independence. Looking at the results, we see that while the independence camp achieved 100,000 votes more than in 2015, thus rallying a number of previous nonvoters, the total vote for the constitutionalist camp increased by 300,000. This means that a large part of the turnout from former nonvoters was a mobilization for Ciudadanos. The other important question is where this vote comes from. Ciudadanos was the most voted for party in Barcelona, in its hinterland, in a major city like Tarragona, and was even second party in Lleida and Girona [a fortress of Puigdemont’s party and pro-independence sentiment]. It is also worth looking at the districts where it is doing best. In Barcelona, Ciudadanos was the first-placed party in both the richest and the poorest neighborhoods. It took a lot of votes from the well-off neighborhoods that normally vote for the Right, but also the poorest ones, where social inequality is highest. This is also true of the hinterland of Barcelona, the Barcelona metropolitan area, which are home to what was once called the proletariat: the working classes, the popular classes. They are above all migrants who came from the rest of Spain in the 1950s to 1970s, and their children. They are Spanish speakers and have never been Catalan nationalists. When I was in Barcelona I heard much of this working-class belt around Barcelona, populated by non-Catalan Spaniards opposed to independence. Is part of the dynamic that these people of working-class backgrounds would not be willing to vote for the traditional right, but will vote for a “new” party like Ciudadanos? Yes, exactly. Also because during the election campaign the posture Ciudadanos adopted was to say “let’s stop with all this talk of independence, and get down to solving people’s real problems, and the real social problems.” Ciudadanos is a free-marketeer and center-right party, which has nonetheless managed to exploit this polarization over the national question. And Catalunya is today a country divided in two, 47 percent against 47 percent on independence. Ciudadanos has managed to exploit this polarization, and won the vote of a lot of people who felt excluded from the Catalan government, as for the last five years the government has only spoken for the pro-independence side, within their own region. They have been mobilized also because they fear the consequences of a unilateral road to independence, and in that sense it made most sense for them to go out and vote for Ciudadanos. Catalunya en Comú takes a less sharp — one might say more ambiguous — position on the national question; it includes sovereigntists and defends Catalans’ right to hold an independence referendum, but is not a pro-independence party. It seems not to have succeeded with a similar discourse of focusing on social rather than constitutional questions, and in this election fell from 11 to 8 seats. Has its political space narrowed? In the electoral campaign Catalunya en Comú did very well in terms of the political space it maintained, criticizing both the tough line taken by the Rajoy government and his use of Article 155, and the unilateral path to independence. It sought to focus the electoral campaign on the social problems in Catalunya. The problem is that at a time of such great polarization over the national question, in the popular neighborhoods — where there was majority support for Ada Colau as mayor of Barcelona in May 2015, and where the biggest vote in the December 2015 and June 2016 Spanish general elections was for En Comú-Podem [i.e., the forces involved in Colau’s coalition, together with the autonomous Catalan section of Podemos] — they now prefer to vote Ciudadanos, because they see it as a firmer and more useful guarantee against independence. Without doubt, Catalunya en Comú-Podem had difficulty in advancing its own discourse of the need for dialogue, and has often been accused of ambiguity. I would not accept that its position is ambiguous, but perhaps it could have taken a firmer position against the Catalan government’s behavior and against the unilateral route to independence. That cost the Catalunya en Comú-Podem alliance a lot of votes in precisely the areas where it should have expected to enjoy strong support; the areas where we see the typical Catalunya en Comú voter, namely the working and popular classes who have been hit hard by the economic crisis. These voters did not clearly hear our position on the national question, because they did not consider us sufficiently critical of the unilateral road to independence. But despite this fall in its popular vote, adopting such a stance has helped hold Podemos together, in terms of the party’s own internal unity? One of the striking aspects of the result is that despite the great flux within each camp, and the higher turnout, the support for the pro- and anti-independence blocs as a whole was static. There may be a pro-independence government, but it is short of 50 percent support and has no clear route to independence. In Scotland, where there is a somewhat comparable situation, some have spoken of a risk of “Ulsterisation,” in their view evidenced by the rise of both the SNP and the Tories, to the expense of Labour. Certainly neither Catalunya or Scotland has the same history or the same intense sectarianism as in Northern Ireland. But is this process taking place in Catalunya? Has this led to a rise in the politics of identity? Has this reduced the space for the Left? Very much so. Really we just need to look at the electoral results: the two parties with most votes were right-wing ones, i.e., Ciudadanos, the right wing of the unionist camp, and JuntsxCat, the right wing of the independence camp. Once again, this polarization over the national question has crushed the Left. Some sections of the Catalan left have long said that the Catalan independence process could drive the collapse of the post-1978 regime in Spain at the same time as creating a Catalan Republic. But what we are seeing, and what we saw in the election result, is the opposite. The Right and the parties of the old regime are getting stronger. It is true that Ciudadanos is a new party, but its project is in fact to further centralize Spain and weaken the autonomous status of the regions. The independence process and the resulting polarization around the national question has, ultimately, allowed a corrupt and crisis-ridden party like Convergencia — today JuntsxCat — to regenerate itself, refound itself, and maintain itself in power. For Rajoy there is a real risk in the advance of Ciudadanos in Catalunya, because the rise of a rival party could challenge the PP’s hegemony over the Right. But taking Spain as a whole, the last three months have seen the PP’s fortunes improving. The defense of national unity against Catalan independence has considerably bolstered Rajoy’s strength in the rest of the country. He has problems with Ciudadanos, but the Right as a whole is making progress. And in its defense of the Catalans’ right to decide, and its project of a plurinational Spain, Podemos is losing a lot of support. This has been a very courageous stance to take, but has doubtless lost votes; and the same is happening in Catalunya with Ada Colau and with the fall in the vote for Catalunya en Comú-Podem. The problem of Ulsterisation is very real. And that is also worrying in terms of its future consequences. Throughout the 1980s, 1990s, and so on, Catalunya was never a divided society in this sense. It succeeded well in integrating the massive wave of immigration from the rest of Spain that took place in the 1950s to the 1970s, despite the language difference, whereas there is now indeed a risk of Ulsterisation. If this crisis keeps on going, and it becomes harder and harder to find a way out, it could mean a split that goes beyond voting this way or that, for or against independence. I do not mean that there is a risk of violence. But the risk is the division of the society into two blocs. This is also a geographic division: the inland areas where there is sometimes a 70, 75, 80 percent vote for independence, and then Barcelona and the coast up to Tarragona, where they vote 60 percent or more against independence. So there you have two Catalunyas, a division that also has to do with the language people speak, the areas their families come from, and their social background. Independence support is strongest among the rural middle classes, who speak Catalan. And if you look at studies in this regard, these are people who say they identify as just Catalan, or Catalan more than Spanish. They speak Catalan and are of Catalan background, and vote for independence. If you look at the results of the regional elections from the 1980s, 1990s, 2000s, that divide was already there. But two things have changed. Firstly, is that until the 2010-12 period, there was a broad consensus in favor of catalanismo. All the parties accepted this lowest common denominator. Some were more or less for federalism, for centralism or for independence. Ciudadanos was the party that came along to reject this. It does not have catalanismo as part of its statutes. The Socialists do have this. Even the PP in Catalunya defines itself as catalanista. But with the lurch forward in the independence process since 2010-12 the catalanista consensus was broken. Ciudadanos has become the biggest anti-independence party, with 25 percent of the vote, whereas Convergencia has become a party explicitly for Catalan independence, which it was not before. So there was always a division between two Catalunyas, but in the past there was an almost universal consensus for integration, for Catalan autonomy and the creation of a single people. The message, this key element of Catalan politics since 1978 [the year of the passing of the Constitution for Spain’s post-Franco democracy] was shared, except in the case of a few outliers. With the split between two Catalunyas, it becomes difficult for there to be any dialogue. From what you can see, does this divide also spread across the generations, in the sense that not just migrants from the rest of Spain are largely opposed to independence, but their children are too, even if they are themselves born in Catalunya? We do not have any specific survey data on this, but surely in the majority, yes. There is weak support for independence among those who are pejoratively called charnegos, which is to say the Catalan-born children of immigrant Spaniards, or else children who have one Catalan parent and the other from the rest of Spain, who would thus largely speak Spanish and not Catalan in the home. For certain some of them would vote for independence, but only a minority. This is why I say that while there has always been something of a division, what held things together before was the glue of catalanismo, and without that consensus everything is breaking apart. In this complex situation, faced with the mounting divisions of which you speak, what can we expect to happen next? The ball is now in Rajoy’s court. His usual approach is more cautious, preferring to wait and see rather than to act. He really has two options open to him. One is to accept the result and say that we should now go forward with a dialogue process, including the pro-independence forces, to try and ease the tensions over the Catalan crisis. But such a move by Rajoy would also risk bolstering a right-wing opposition in the rest of Spain, critical of any such dialogue with the independentists. Such a space to the Right of the PP could clearly be occupied by Ciudadanos. While on some social questions and matters of civil rights, it is a little more progressive than Rajoy’s own party — or rather, less conservative — on the national question it is clearly to the Right. If Rajoy makes any opening, it risks creating a deadly competitor in the rest of Spain. The other option, precisely to avoid this, is to take an even harder line than he has thus far. This would help maintain his hegemony within the Spanish right, but at the risk of entrenching the Catalan crisis for decades to come. Isn’t the second option preferable from Rajoy’s point of view, in terms of his immediate political challenges? What could he offer the pro-independence forces? There are possible options that were not tried yet, which there could be dialogue over between the Spanish government and the pro-independence parties. For instance, questions of the distribution of funding, or perhaps reforms to the Spanish constitution. Thus far there have been no concessions, and no indications, in that sense. But at the same time we also have to consider the other political barriers. We can look in particular at the next month or so, which will be a crucial period for Catalunya. Its Parliament will meet on January 17, and it will have to elect the president of the Generalitat, i.e., the head of the Catalan government, who will have a decisive role in everything that follows. The president will be chosen at the end of January. So we have almost a month to bring some clarity to the whole situation. In this, the Spanish judiciary will have an extremely important role. One thing the Catalan independentists say which is very naive is that Rajoy should release the imprisoned MPs and revoke the arrest warrants for the other MPs abroad. But however we might criticize the politicization of the judiciary, which certainly exists here as in other countries, there is still a separation of powers. Rajoy cannot simply tell the judiciary, “OK fine, cancel the arrest warrants and release the prisoners.” Once the machinery of the law sets in motion, it is impossible to stop it. So it is not as if Rajoy can simply tell the judiciary to leave it be. Nor can there be an amnesty, before the actual sentence. And the trials will last for months or even years before the sentence is given, not least given the complexity of these trials and gathering the evidence. The judiciary is going to be a major actor in this, and the Catalan independentists will use this to say that Spain is not a democracy, and to seek international intervention. Such intervention is of course impossible; to claim that it is possible is to show a lack of understanding of the basic rules of geopolitics. Spain is a NATO country with two important US bases; it is an EU country, and neither the US nor the EU want the territorial integrity of Spain to be put in question. Never would the EU, the Commission, or other foreign countries sit down at the table to mediate between a national government like Madrid and a regional government like Catalonia. The risk we instead face is that this will not just be a crisis of the present moment. Rather, it may create a lasting split in Catalan society, which it will take generations to overcome. Steven Forti is co-editor of the recent book El proceso separatista en Cataluña .